Some ten years ago I was living in Paris with a wonderful woman. We lived there for three years and used the opportunity to travel around Europe. A few years earlier, we had spent a summer traveling in Western Europe. Something that a fair amount of North American students do after their bachelor’s degree. This time we could afford a little bit more luxury and we would usually stay at bed and breakfast when traveling to Vienna, Prague, Dublin, London or Brussels. At the time we also visited Stockholm. That was my first – and only – visit to Stockholm until I moved here last September. I remember that despite having a very bad cold, my girlfriend was enjoying every minute of our long weekend in the Swedish winter. Strangely, I do not have a lot of memories from that weekend, other than we were staying at a very gay friendly small hotel. My girlfriend was probably the only girl in that place. I remember the staff being very nice and friendly. 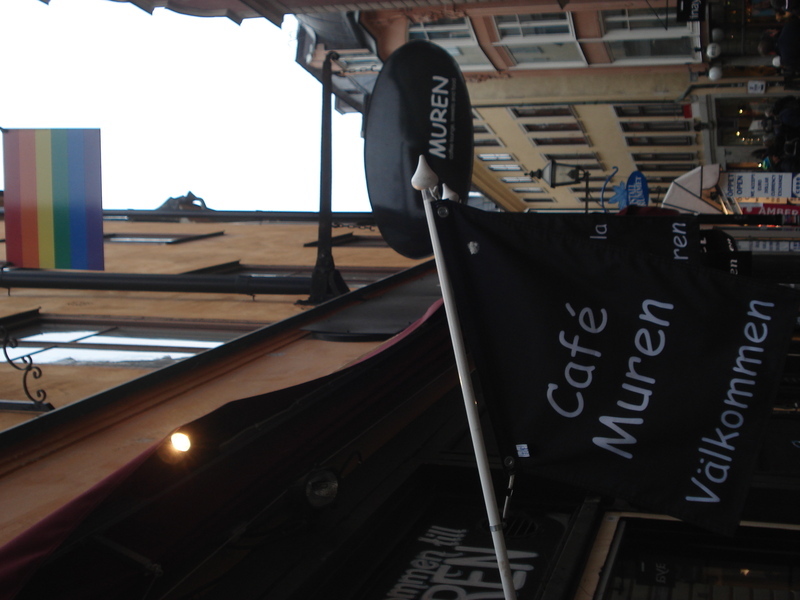 And I also remember stopping at Muren for a hot chocolate and a muffin (I wasn’t drinking coffee at the time!). Café Muren is on one of the main streets in Gamal Stan, just a few doors away from Schweizerkonditoriet. Since I moved here I have been passing by Muren hundreds of times without realizing that this was the café of my memories. It just hit me a couple of weeks ago when I looked through the windows and saw the table by the brick wall where we were sitting in December 2001. It took me some time to decide whether I wanted to go back but I finally did today. By its location, Muren will of course attract a lot of tourists. And even today in this grey Saturday of January, the majority of customers at Muren this morning were foreigners. Nonetheless, Muren, just like Schweizerkonditoriet, is doing a good job at creating a warm atmosphere. 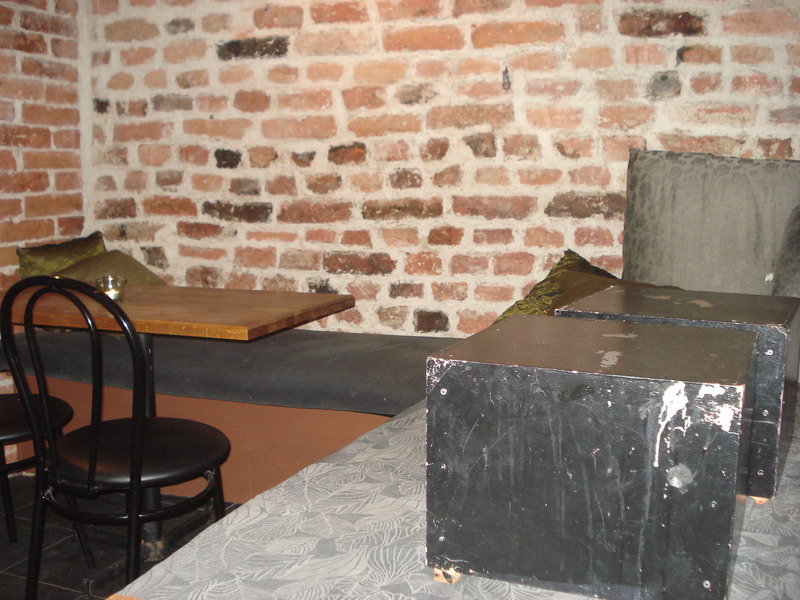 In the case of Muren, I suspect the brick wall has a lot to do with the warmth of the place. Today was a weird day. My friend RF who arrived in Stockholm a few weeks after me was going back home, much sooner than expected. We had a few beers last night and after too few hours of sleep I drove him to the airport this morning. It was one of those days where I pick sleep over breakfast! By the time I arrived at Muren just before noon I was starving. 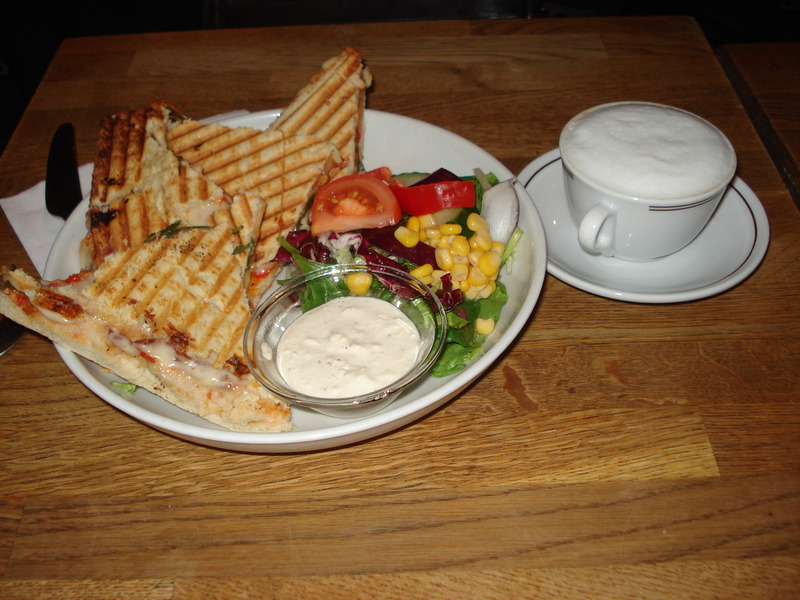 Thankfully Muren has a nice menu and I had a vegetarian foccacia with a cappucino. Muren is a nice café in Gamla Stan. I think it is safe to say that I enjoyed it much more in 2001. But that has nothing to do with Muren… By the time I had finished lunch, the place was getting pretty full and I decided to leave my table to new customers. I was spending too much time thinking about the past anyway and it was time to go somewhere else. I can be a nerd sometime and I had taken my Swedish homework with me when I left home this morning. So I decided to go to a place where I knew I would see some friendly faces and where I could enjoy another cappuccino while trying to understand the plural in Swedish. I went to Amsterdam. Edison and Samantha were there, nice and friendly as usual. I needed some strength to go through my homework so I had a very nice spicy soup. 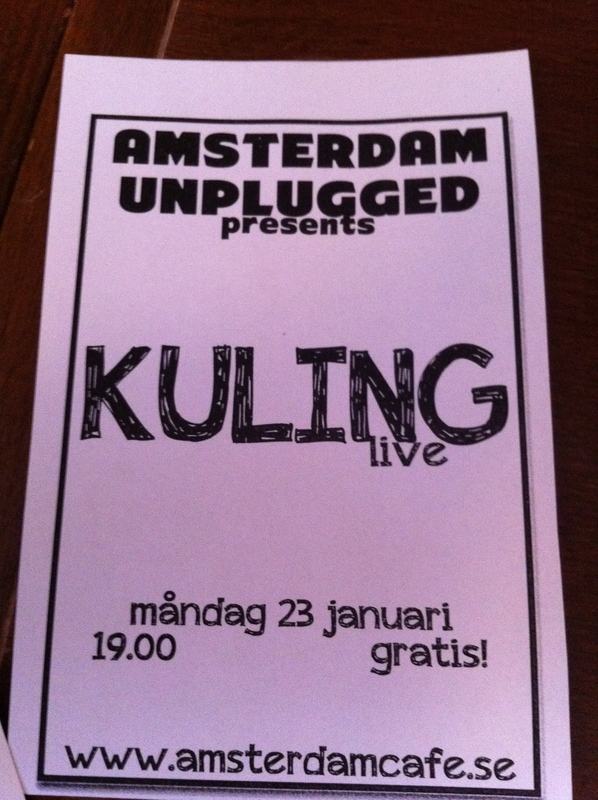 I think I will go back to Amsterdam on Monday! 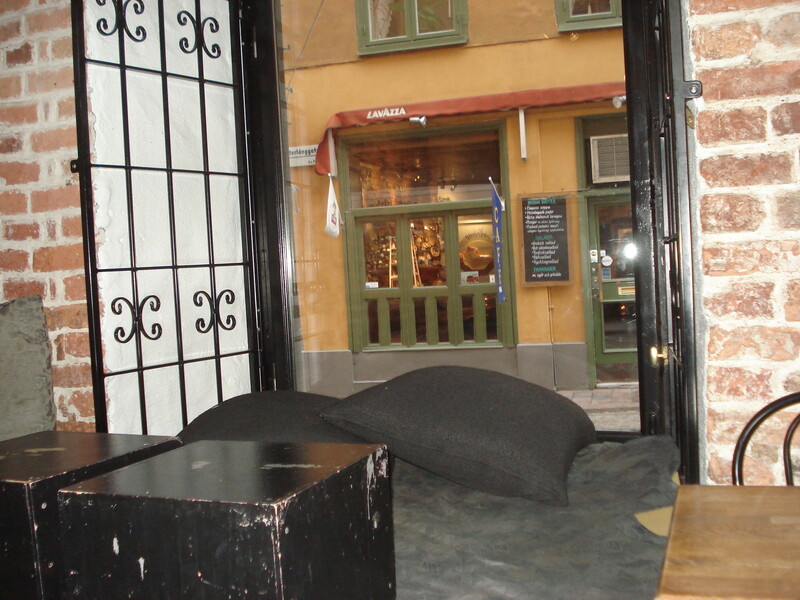 Meanwhile, if you are in Gamla Stan, have some coffee at Muren. How cool that you were able to recognize having been there before by looking inside and seeing the place where you had sat once! What a sweet story. I can understand lots of memories raised from this special café. I think I might have been there once on their terrass in the summer. Thank you 🙂 Over two weeks I am in Florida! You are a great writer! I always feel like I get to experience the the coffee shops with you and you leave me wanting to read more! : ) I also like how you strike a nice life balance between coffee, beer and homework! ps. I went to Le Nordik today and it made me think constantly that I was in Scandinavia! Wow! Thanks Emily! That is very nice. It would be really fun if you could stop by one day and enjoy a few coffee shops with me. And now that my drinking buddy is gone I will try to strike a balance between coffee, homework and running (I haven’t been very good with the latter lately…). Hope you had a great time at Le Nordik today. It is a lovely place!